There comes a time in every girl’s life where the pink room with the ruffles and pretty chandelier just doesn’t work any more and her dreams of the perfect bedroom change. Well for this pre-teen, it was that time…and she couldn’t be more ready! 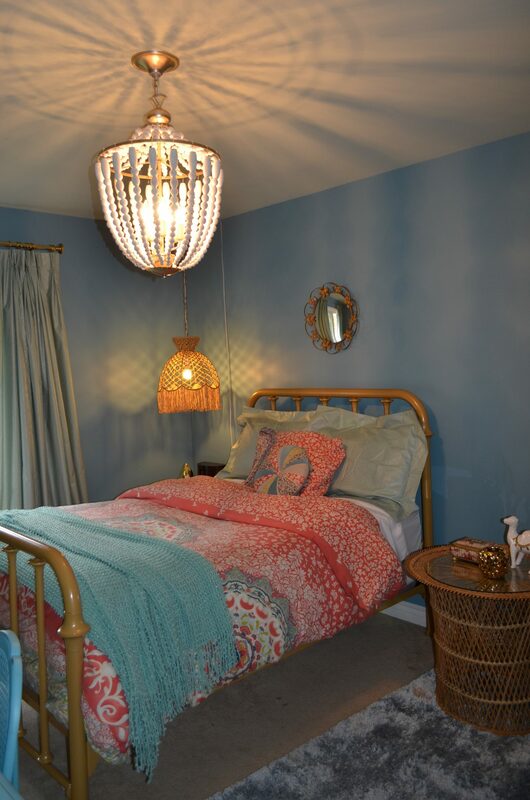 Out went the twin bed and crystal chandelier, and a new…more colorful… more relaxed atmosphere was what she was after. 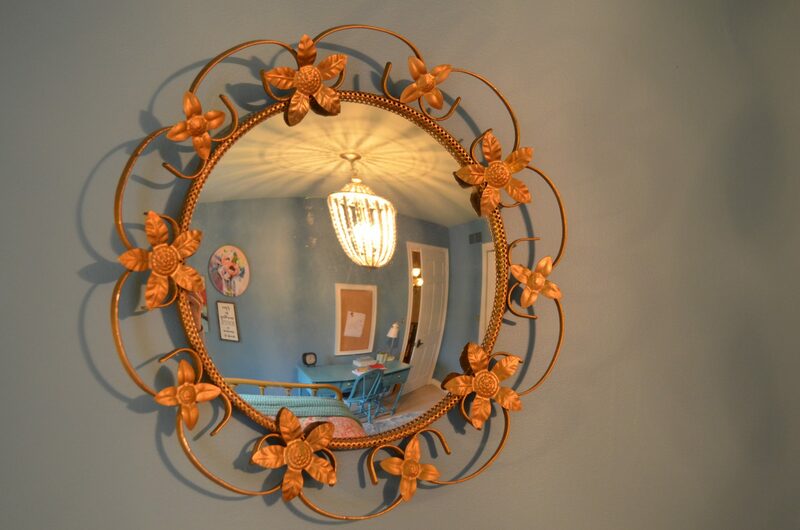 Many vintage items, along with some new purchases made this room ready for her next stage of life! The starting point for this bedroom was the bedding which had already been purchased. We chose the paint colors right away and decided on Whipple Blue for the walls to create a lovely contrast with the coral tones of the bedding. 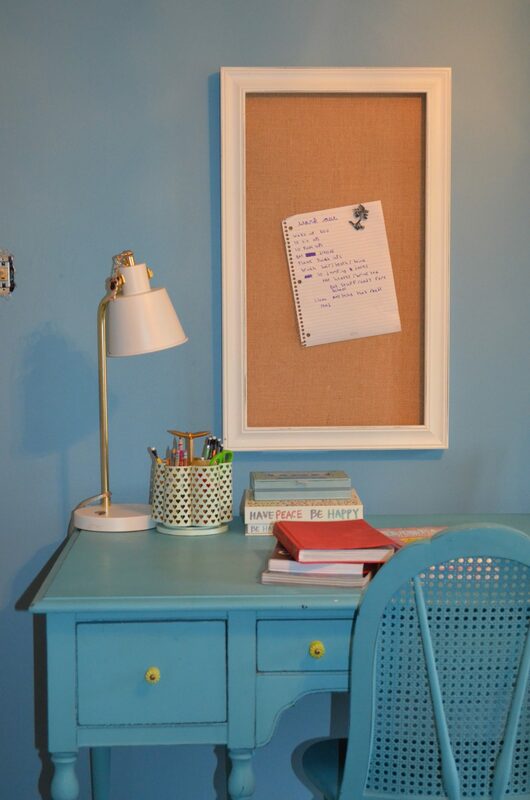 They wanted a wall color that would stand out and give the room a completely different feel than it’d had before, and this mid-tone blue created a much more inviting mood. 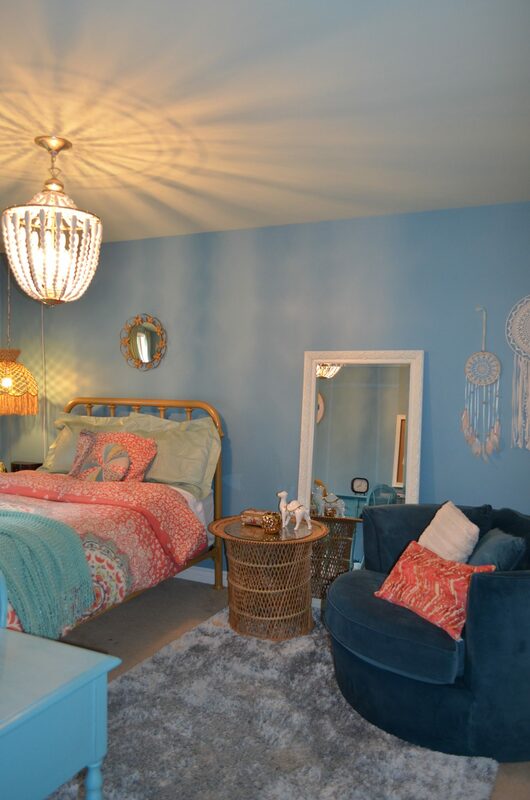 As there was a good dose of aqua in the bedding as well, we painted the ceiling Blue Grass and then had the custom drapery and matching shams made to pick up on that hue. 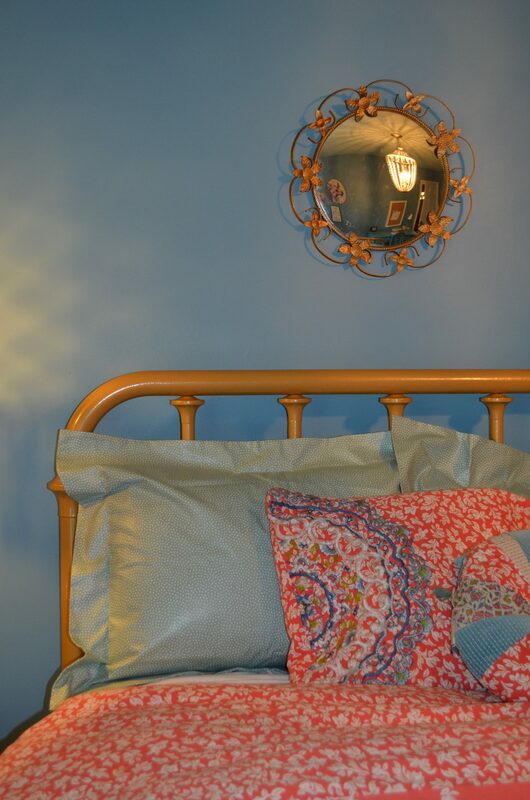 A simple dot pattern was selected that coordinated with the bedding and didn’t look washed out with the wall paint. 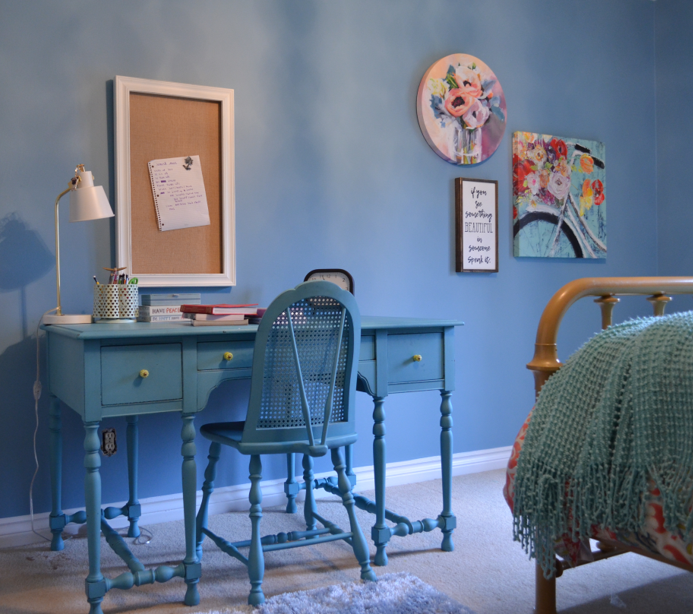 We also picked up the aqua in the deeper tone of the desk we purchased through online classifieds and had chalk painted in a custom color. To create that boho-vibe, many of the pieces purchased were sourced from the Antique hub of Ottawa Street in Hamilton. 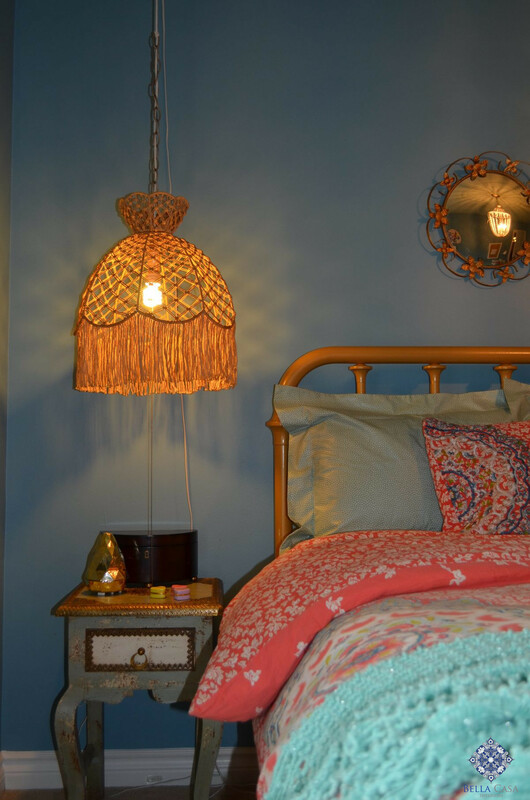 The brass bed, wicker pieces (don’t you love that hanging lamp? 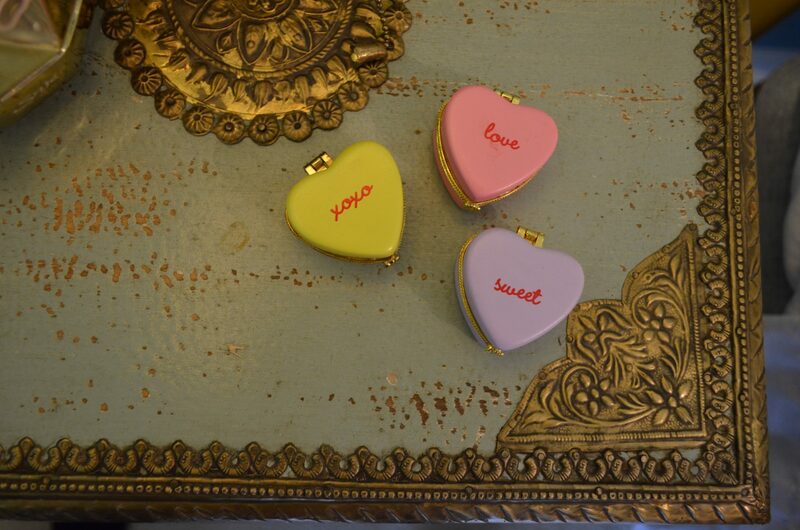 ), and some accessories added that vintage charm without being to sweet. The sink-in-and-stay-a-while chair was the perfect spot to curl up and do homework–or her nails. The client found and purchased the soft shag rug and the wood beaded light fixture adds the relaxed yet chic element that finished off the room wonderfully! 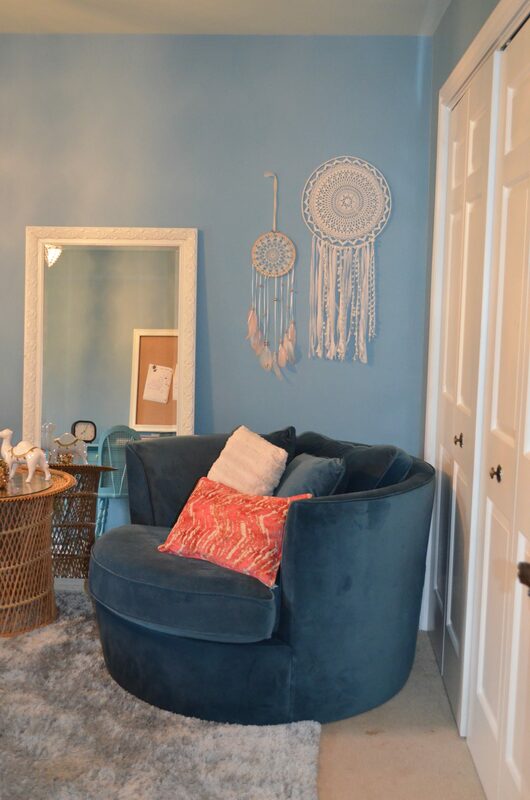 Colorful artwork & crochet dream catchers add punch to her walls, along with a much needed cork board over her desk. 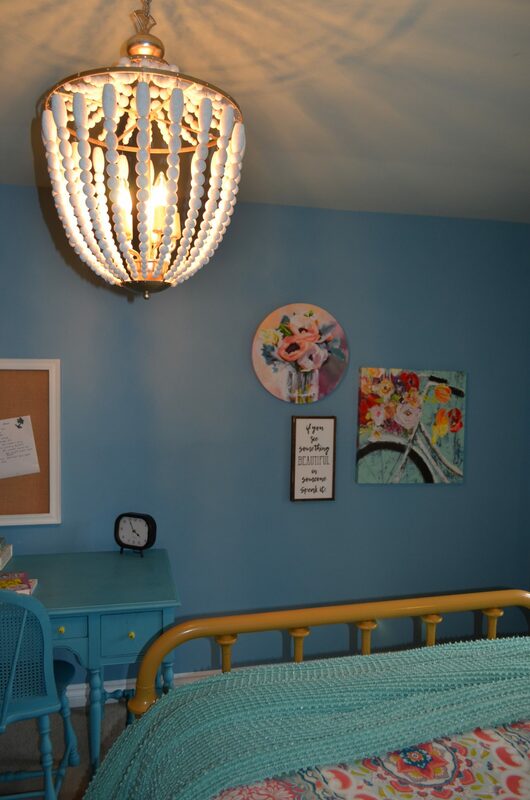 This young teen was over the moon with her new bedroom—and the makeover a complete success! To hear more of the behind the scenes process, sources, and the “before”, be sure to check out these blog posts!